2011 is a huge year for the Padron Family. 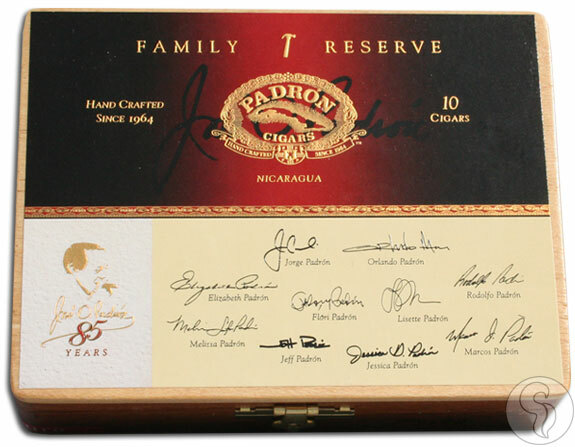 Being that it's the year that Jose O. Padron celebrates his 85th birthday, the Padrons released the 2011 Family Reserve blend called the No.85. Like the previous releases of the Family Reserve blends, the No.85 comes in natural and maduro wrappers and uses their most aged tobacco, creating an extremely rich and flavorful blend that only the Padron Family can create. Measuring 5 1/4 x 50, this is the smallest of the Family Reserve cigars. But since this cigar was named the No.85 in honor of Don Orlando's birthday, this Family Reserve holds a special place in our hearts and we know it will find a place in yours, as well.